IF YOU ARE JUST HERE FOR LINKS TO CHECK OUT/BUY THE DESK AND DECORATIONS, SCROLL TO THE BOTTOM OF THIS POST, FRIENDS! Our Instagram may give the impression that we spend every waking minute together. Society itself may also give the impression that couples should always love spending their time together. To us, that seems silly and even somewhat unhealthy. Nick and I love each other deeply, but we are still individuals and - in many ways - we are very different from one another. Part of being the best for each other means finding ways to continually explore our individuality. It took some life-learning trial and error to realize that love isn't a fix-all for every problem in a relationship. No matter how deep the love is, relationships take work, and it's silly to think that love alone will make them work. Perhaps the younger generation following us will be less inclined to think love is a heal-all fix, but we definitely grew up in the 1990s Disney-movies-where-love-overcomes-all era. Looking back on our past relationships (pre-Justin and Nick, if you will), it is easy to see how we both clung to those 1990s Disney values. When things went poorly or if we encountered hard times, it was easy to throw in the towel. If love didn't fix it, it wasn't real, right? Wrong. People - individuals - are the sum of their experiences. We all bring so many different experiences to the table, and these shape our viewpoints on so many things. No two person is the same, and part of learning to navigating amongst diverse perspective is just realizing that it's really damn diverse. Nick and I are no exception, and I'm sure a lot of you who have followed us - particularly on our YouTube - for awhile have noticed some of those difference. I tend to be the more reserve, more serious one. I dislike public displays of affection, I really dislike messiness, and my political viewpoints tend to be much more liberal. On the other hand, Nick is more carefree and fun. He loves public displays of affection, he functions much better in messiness than I do, and he tends to be more center-of-the-road politically. To each other, we find ourselves highly different from one another. Here is Nick, obviously reading "Harry Potter and the Deathly Hallows" for the millionth time! We've both had to learn how to navigate being individuals while also sharing so much of our lives together. The most important thing is that we've built a foundation on love, but we also realize that love isn't a "fix-all" for all of our problems. Individuality needs to be nurtured, and we've both come up with our own ways to do just that! We embrace these differences though. Speaking for myself, I know that Nick helps keep my mood light and forces me out of my comfort zone. I also appreciate that he doesn't think like I do and that he challenges me to re-evaluate my own thoughts, perceptions, and ideas on things I otherwise would not have. I also know Nick feels the same about me (he's talked about needing someone serious to help balance him out, and he also has said that my passion for social justice - in particular - has made him think deeply about current events). If it says anything about me, I also got Nick hooked on NPR, haha! Embracing our differences also comes with the caveat that we must find time for our individuality. We must have places where we can go to be in our own head without constantly needing to feel like a "couple-entity." Especially thanks to social media, the impression for many is that we constantly adore each other's company. The truth of the matter is that we often need breaks from each other. We get mad at each other. We argue. We disagree. Sometimes, we just need "me" time for no reason. For me, an escape for my individuality comes in two places: my journals and planners as well as my personal space. Here it is! This is my personal space. Sure, this is in the bedroom, so it isn't exactly always the most private spot. However, it works perfectly for a quick, quiet getaway. The desk also functions as a nightstand (yay, smaller space functionality)! The desk, pillow, and throw are from West Elm. The mid-century modern chair is from Wayfair. Scroll down if you are interested in checking out any of these items for yourself! As I've already pointed out, I'm very type A. This includes being very detail-oriented with planning out my weeks (and sometimes months) ahead. I have a planner by which I live and die (not even an exaggeration sadly), and then I also love creating loose plans for our upcoming trips in fun ways that make me tap in to my artistic side. Getting lost in my planner gives me a creative outlet (I know it sounds silly, but it really does), and it also gives me a sense of peace to be able to tune everything out for a bit while I plan and draw. In order to do this, though, I need a space to do it at. Here's my travel journal! I love planning out trips and at least having a general sense of the things I want to see during a trip. I also get a lot of personal clarity out of channeling my energy into drawing and other outlets. Another shot of the travel journal! So many people have given us great recommendations for our trip to Italy, so I made sure to write down some of the most promising ones (leave some comments on this blog post if you have some travel tips for Northern Italy, too)! Perhaps the most complicated thing is the personal space. Nick and I love the location of our apartment; we are right downtown in close proximity to so many things. However, what we gain in convenience and location, we lose a bit in square footage. 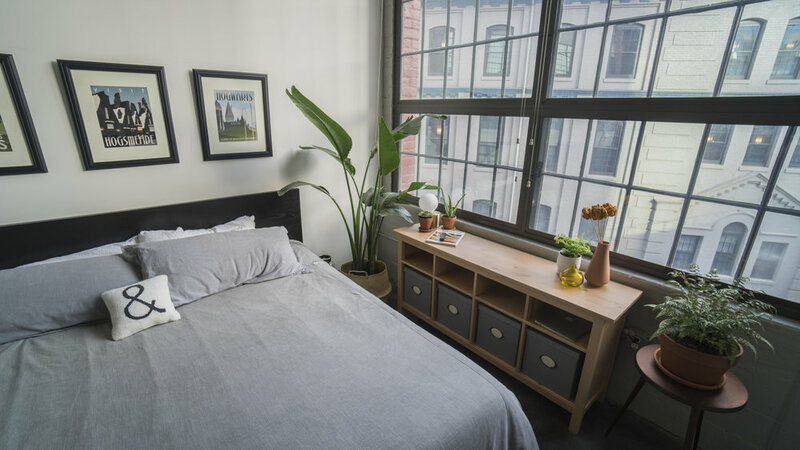 Our apartment is plenty big - perhaps bigger - than what we need, but an apartment still doesn't lend itself to creating private spaces to "get away" at home. In order to have some space to ourselves, we've had to improvise. I created literally the smallest nook to do work, draw, and read, and the center of it all is my West Elm Ladder Shelf Desk (and it's the Sand/Stone color in case you're curious)! If you've been following us for awhile, you've seen plenty of the bedroom! However, you might not have seen the whole thing yet! Honestly, it's newly become my favorite room in the house (not just because I have my special nook here) because of the yellow/blue/grey theme and all the urban greenery (and, as always, we love these 12 foot tall industrial windows)! This Langley Street Whiteabbey Side Chair from Wayfair was a steal, and it looks perfect here. It's also comfortable. Did I mention it was cheap (it actually came with two chairs)! The pillow and throw are from West Elm, and I absolutely love them! Again, I have links down below in case you want to snag any of this. The West Elm Ladder Shelf Desk is the perfect size for our apartment, gives me some space above the desk to decorate with some of the favorite books and plants, and easily holds our MacBook Pro and a desk lamp. We did a story with Nick reading in bed where you could see the desk, and so many people responded to the Instagram Story asking where the desk was from. Honestly, it's my favorite purchase ever when it comes to furniture, and now is the time to snag it up. It's currently on sale at about $100 USD cheaper than normal. While West Elm isn't always known for being the cheapest, they often have great sales (like now on the desk), and I often find steals with other pieces. For example, I used Wayfair to grab a cheap, lightweight chair for the desk: the Langley Street Whiteabbey Side Chair. From there, I just added my favorite books (trying to match the yellow-green-blue-grey color scheme of the room), my favorite plant (a maiden hair fern), and voila: I created a space for myself to escape. I have an addiction to coffee table books and this "California Captured: Mid-Century Modern Architecture" is probably my favorite that I've ever purchased so far! In addition, I do love all the other books here as well as the maiden-hair fern. I snagged the ceramic birds on Etsy, and I think they are just the cutest! Adding all these items is a reflection of me in my personal space. I love architecture (particularly mid-century modern) and urban planning. I also am a huge fan of cerebral science fiction ("Authority" is one of the books in the Southern Reach Trilogy, which includes "Annihilation" if y'all have seen the female tour-de-force film earlier this year). Travel is also my number one passion, and chief among it is East Asia (I lived in East Asia for three years). All things thrown together, this space is mine, and it's my escape. Another angle on my "escape" nook! Here, you can also see my stationary pens, highlighters, and felt tips! I often use this space to doodle and draw in my notebooks. I hope you've enjoyed this blog by getting this glimpse into how I bolster my own individuality by creating a personal space just for me! Let me know what you all think in the comments! By having activities that I can do to calm myself in a space that I love, I've been able to create a sanctuary of sorts. I love Nick, and I know that he loves me. Nevertheless, we also know and respect that - inevitably - we will need our space from time-to-time. If you were like us in thinking that everything was suppose to play out like Stockholm syndrome-turned-into-daddy-beast-fall-in-love realness, I highly encourage you to re-evaluate your definition of love. I'm not saying you need to throw away what you think about it. I'm just saying to take a moment and think how you come to the conclusions you did. I, personally, know I am a much better partner for Nick by realizing that we are individuals who need space. I also know it makes me work harder. Knowing that love takes and deserves work elevates its importance. It became something I no longer take for granted by simply assuming the presence of love was a salve for all my problems. Relationships take work. Ours is no different. We moved to Virginia about ten months ago, and our mission was to create a space that we loved coming back to. Like many starving graduate students, our apartment back in Pittsburgh was passable, but it wasn't necessarily a space that we loved. Moving also gave us the opportunity to get rid of some Craigslist mismatched furniture that we had collected throughout college. Justin enjoying all his hard work! He tends to be the more type-A particular one, so he took most of the bedroom re-design on his hands. We wanted to bring outside into the bedroom. We also try to go with yellow-orange-red hues to add a pop that compliments that old smokestack outside. Plants from left to right: bird of paradise, succulents, aloe vera, maiden's hair fern, and Japanese painted fern. We fell in love with our apartment for two reasons: first, it's a renovated historic warehouse that was used in Virginia's old tobacco trade (we love a backstory, honey), and second, the huge windows! As soon as we moved in, we set about snatching up furniture. Most of our focus was spent on the living room and kitchen areas for the first few months. We figure - why not hone in on the areas where guests will spend the most time? After literally months of dragging our feet to update our bedroom, we finally dove in last weekend. We love mid-century modern furniture, so we've been frequently checking out their website to find pieces that will tie in our look. We eventually settled on some dried flowers and a copper metal side table from West Elm. IKEA provided the console table, and we couldn't be happier with the pine wood brightening up our bedroom (especially since much of our furniture in there currently is black or off-black). What Justin wasn't happy about was spending the afternoon putting the HEMNES console table together (but who does like that). Many of the small items were just things we have slowly been picking up as we go out. Justin loves architecture and urban design, and Zaha Hadid is his absolute favorite architect. It just also happened to work out that the gold-orange tones in the coffee table book worked with the overall color scheme we were going for! After tackling putting together the IKEA console table, we got everything moved into the bedroom and started decorating. We wanted to create a space that we loved spending time in. For months, our bedroom has been mismatched and cluttered, simply because we had so little time to spend designing it with our busy work schedules. Now, though, we absolutely can't get enough of the bedroom. Even though the bedroom space is small, the light colors make it seem larger. The plants - along with being beautiful - help purify the air and just generally lend to us feeling so much better about our space. It's sad and adorable how much Justin wanted a maiden's hair fern. He's been looking for one forever, and it was an intense moment when he finally came across one here in Richmond. We also can't remember the name of these dried flowers for the life of us, but they are from West Elm and pretty spectacular! Another shot of the finished room! We have a king size bed, and most of the square footage in our apartment is in the living room-kitchen area. Given that, we had to think about how we can both brighten the room, draw attention to the large windows, and incorporate the natural light. The end goal was to make the room feel welcoming, but also to brightening it up and make it feel clean, comfortable, and big. We hope you guys enjoyed taking a peek into our bedroom redesign. It honestly was low effort and low cost for a whole lot of SHABAM. We are proud of it, and now we are looking forward to welcome our moms down to Richmond for mother's day (mainly to show them that we learned from their expert guidance growing up)!